Last week saw a flurry of activity in UNITE HERE’s ongoing struggle to preserve its membership and jurisdiction. As SEIU dispatched organizers to disrupt UNITE HERE organizing efforts at Phoenix’s Sheraton Convention Center Hotel, UNITE HERE responded by distributing flyers to SEIU’s public employees in the city telling them what their union was doing to undermine hotel workers. Negotiations between the two sides broke off on April 30, leading UNITE HERE President John Wilhelm to charge that SEIU was “insisting on taking a large number of UNITE HERE members in hotels and gaming, as well as the right to organize in the hotel industry competitively with us.” SEIU President Andy Stern issued a public appeal for Wilhelm to continue negotiations, and offered to submit all outstanding issues to binding arbitration. Wilhelm responded on May 1 that no International union has ever submitted its future to arbitration. Wilhelm also asked, if Stern favored binding arbitration, “Why didn’t SEIU propose arbitration in your dispute with United Health Care West and Sal Rosselli”? One development over the past weeks is undisputed: UNITE HERE is now putting SEIU on the defensive, shifting the debate from an internal union fight to a broader challenge to SEIU’s overall direction. The conflict between SEIU and UNITE HERE is escalating. But after SEIU subjected unionized hotel workers to anti-UNITE HERE robocalls, mailings, and personal contacts, and used every means to force UNITE HERE to surrender, the tide has turned. When I last wrote about this dispute on April 7, I described how UNITE leader Bruce Raynor precipitated this conflict after learning he would not be elected the sole President of UNITE HERE at the union’s June 2009 convention. But Raynor is now irrelevant, and with the entire UNITE leadership team affiliating with SEIU as “Workers United” on March 23, this is SEIU’s fight. This means that the two unions thought to be the most politically and philosophically aligned, whose organizing staffs include many longtime friends and allies, and whose leaving of the AFL-CIO in 2005 made the creation of the Change to Win Labor Federation possible, are now at war. Stern insists he knew back in 2004 that the merger of UNITE and HERE was a mistake, and that it should now be undone. He offered all of UNITE HERE to join SEIU, and Raynor and former UNITE officials agreed. But former HERE officials were not interested, and continue to legally challenge the ability of portions of UNITE HERE to secede and move to SEIU. 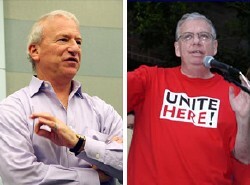 In fact, while Stern describes his offer for all or part of UNITEHERE to join SEIU as a way of addressing a failed merger, Wilhelm and the majority of UNITEHERE leadership saw Stern’s offer as encouraging Raynor and other former UNITE leaders to secede. It’s clear that if Stern thought that he was furthering labor peace by offering the original UNITE portion of UNITEHERE a home at SEIU, he badly miscalculated. After the former UNITE portions of UNITEHERE joined SEIU on March 23 (under the name Workers United), Stern, SEIU’s premier communications team, and the former UNITE’s media team – which had previously handled HERE’s publicity – portrayed SEIU as reluctantly intervening to bring labor peace, and merely picking up the pieces of a broken marriage. SEIU insisted that they had no role in the pre-March 23 attempted raids of UNITE HERE bargaining units, the robocalls and anti-UNITE HERE mailers, the claims that Barack Obama wanted UNITEHERE workers to switch to SEIU, or any of the other hostile actions undertaken by Raynor. SEIU insists that its staff during this period was only involved in “defensive” conduct. SEIU has found success with blitzkrieg like attacks on employers, but UNITE HERE organizers are accustomed to multi-year campaigns. A union that has spent nearly six years picketing and boycotting Chicago’s Congress Hotel, and that spent several years before winning union contracts at San Francisco’s Parc 55 and Marriot Hotels, is not a group that panics, or that stays on the defensive. So after SEIU has consistently insisted that the merger of UNITE and HERE had failed to produce the promised organizing gains, UNITE HERE is citing facts that tell a different story. First, UNITE HERE is questioning SEIU’s commitment to its own organizing principles. Specifically, it asks why SEIU is seeking members outside its core areas when such a small percentage of workers in SEIU’s primary jurisdictions – property services (7.95%), hospitals (9.4%), nursing homes (11%) – are unionized. Since announcing at its 2008 Convention that it would target the “90 percent of healthcare and property service workers and two-thirds of public employees still don’t have a union,” SEIU has dropped its leading hospital organizing drive – involving 9000 workers at California’s St. Josephs Hospital chain. SEIU appears to be devoting far more resources to battling UNITE HERE for casino and hotel workers than toward its primary mission of organizing health care workers. UNITE HERE’s statistics show that it has been far more successful than SEIU since the 2004 merger in increasing union density in its core industries. In contrast to the figures for SEIU above, UNITE HERE has achieved unionized density of 19% in full service hotels, 19% in food services, and a whopping 48% in gaming. UNITE HERE’s strong organizing gains since the merger undermines SEIU’s chief policy argument that the merger has failed and should be undone. There is no question that there a major rift between leaders of UNITE and HERE emerged, and that the former felt more comfortable joining SEIU. But UNITE HERE argues that, absent SEIU’s intervention and support for secession, the two sides would have been forced to reconcile their differences, and that the numbers of workers organized since 2004 confirms the merger’s success. On April 30, Juan Gonzalez reported in the New York Daily News that late last year SEIU borrowed $15 million from the Amalgamated Bank. Amalgamated is the only union-owned bank in America, has $500 million in assets, and is controlled by Bruce Raynor and the former UNITE leaders who have moved to SEIU. Rumors of the loan were longstanding, and have led many to accuse Stern of courting Raynor to get more access to Amalgamated funds. But Stern denies that SEIU has any interest in the bank, and the more important fact is that SEIU’s finances are so heavily leveraged that its liabilities now comprise 82% of its assets. In contrast, UNITE HERE’s liabilities to assets ratio is only 22.4%. UNITE HERE understandably asks: considering we have achieved a much greater organizing density than SEIU, and have been more fiscally prudent, what possible justification can SEIU have for claiming our merger has failed? Is it because SEIU has failed to succeed in its own primary jurisdictions and must now raid ours? Or is it about getting dues from the UNITE HERE members who have moved over to SEIU, and repeating Stern’s pattern of building SEIU’s membership less by taking over other unions? On its part, SEIU cannot financially afford an open-ended war with UNITE HERE. SEIU spent over $60 million for the fall 2008 elections, is devoting millions to preserve its California nursing home and hospital contracts against challenges by the new National Union of Health Workers (NUHW), and is also spending more than any other union on passing universal health care and the Employee Free Choice Act. Moreover, SEIU and Andy Stern are weakening their brand by battling with UNITE HERE. Under Stern’s leadership, SEIU has been seen as the nation’s most dynamic and visionary union. This image has brought talented young organizers into SEIU, put the union on the cutting edge of progressive national policy fights, and won Stern consistently favorable traditional media coverage. But in the past year, SEIU lost a high-profile election to represent teachers in Puerto Rico’s, endured a public relations problem over the Tyrone Freeman scandal in Los Angeles, and engaged in a bitter fight with Sal Roselli and UHW, its third largest local. Now SEIU is challenging a union that was once its closest ally, and organizers and staff for both unions have longstanding personal and professional relationships that are being strained if not broken by this dispute. I’ve talked to staff from unions across the nation that have no stake in this dispute, and have yet to find anyone on SEIU’s side. Either I’m talking to the wrong people, or most of labor does not appreciate the potential precedent SEIU is setting by challenging another union’s core jurisdiction. SEIU’s continuing this fight only weakens its ability to exercise leadership in the labor movement. UNITE HERE did not ask for this fight, and their organizers and leadership prefer to be taking on hotel owners, not a fellow union. But when SEIU is potentially raiding their workers – as at the Phoenix Sheraton, where SEIU is asking workers to revoke their signed UNITE HERE authorization cards and instead sign cards for Workers United, UNITE HERE feels it has not choice but to fight to win. As long as SEIU insists on the right to organize in UNITE HERE’s key jurisdictions of hotels, food services and gaming, this battle will continue. But SEIU insists that this dispute is about money, namely, what it sees as Wilhelm’s attempt to “shakedown” the former UNITE. I’ve learned through practicing law for over twenty-five years that when a dispute is only about money – which means that SEIU abandons efforts to invade UNITE HERE jurisdictions – then a deal can be had.